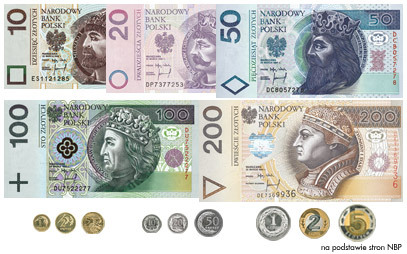 The only official currency in Poland is Polish złoty (PLN), which is currently (January 2013) equivalent of 0.24 EUR or 0.32 USD. 1/100 of złoty is called grosz. Currency exchange may be performed in banks or many private places called "Kantor". They take no commission and usual buy/sell spread ratio is just about few percent. The exception are exchange points on the airports and similar places, where ratios may be far from being competitive. Cash payments in Euro are sometimes accepted in supermarkets and other places, but the exchange rate there might be unfavourable. Card payments (Visa and MasterCard) are commonly accepted in big and medium shops (markets), petrol stations, hotels, restaurants, hardware stores etc. A lot of small businesses also accept them. Sometimes a limit around 2-20 PLN is announced below which only cash is accepted. Thus we suggest to always have a small amount of cash available. Traveler’s cheques are not popular and may be cashed only in banks. ATMs are easily to be found in popular public areas (supermarkets, transport hubs, city centers, bank branches).